D.I.Y. Demi Lovato’s leopard Ombré Nails. In this tutorial, from Nail It Magazine, manicurist Sabella Snyder shows us how she got the look for Demi Lovato’s daring mani at the 2016 GLAAD Media Awards. Prep the nail. Apply two coats of cream polish and let them dry. 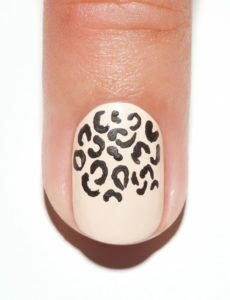 Use a detail brush to paint imperfect black “C” shapes, dots and lines at the cuticle area. Continue painting the design, fading out the pattern as you reach the center of the nail.The leopard print should be concentrated in the cuticle area. Let the design dry, then finish with top coat.